The recent events in Catalonia have sparked an intense and often constructive discussion on the reasons that underpin Catalonia’s claim for independence, and Europe’s need to seriously discuss the need to regulate ‘internal enlargement’. Yet, the complexity of the situation has sometimes given way to inaccurate interpretations of what is happening and, especially, of why a majority of Catalans have gradually embraced the option of independence to the detriment of other options that were more popular some years ago. Last week Jose Javier Olivas posted an article on the LSE Blog Euro Crisis in the Press which provides, in my view, one of these inaccurate interpretations that nurture the increasing lack of commonality of ideas, preferences and values that nations such as the Spanish one are expected to have (see Alesina and Reich, 2013). Are Catalans not for redistribution? One of the reasons for independence that has attracted most of the media attention refers to fiscal redistribution. Catalans, it has been argued, simply believe that too much money is taken out of their pockets to assist other parts of Spain. However, the latter reflects a deep misunderstanding on the ills of the Spanish redistribution system. Solidarity is a concept to which ascribing an exact figure is an arduous task and everyone would agree that zero per cent is too little. But here is where the consensus ends. The fiscal imbalance – i.e. the difference between what Catalonia contributes through taxes to the central state and what it receives back with transfers and services – is around eight per cent of the GDP in 2009 (see p.57). Is this too much redistribution, as many Catalans claim? This is a normative question, and as such, difficult to answer. Therefore, one interesting and, arguably, reasonable way to answer this question is to carry out an international comparison. 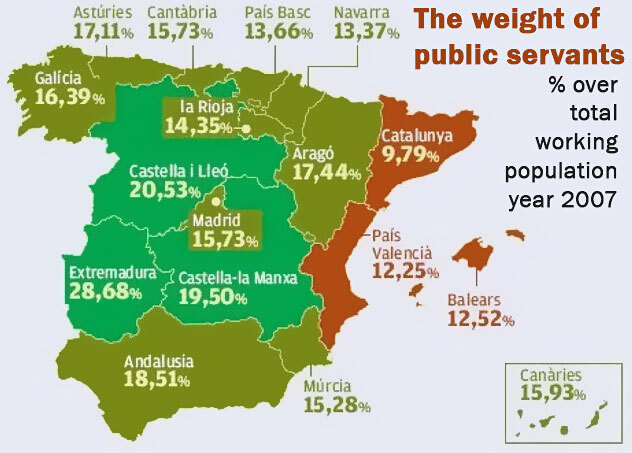 Economics research shows (see an example here and here (p.12-22) that the fiscal imbalance that Catalonia suffers from the rest of Spain is unparalleled in other regions of the developed world.